Now this blog has been long overdue....mostly in part due to my crazy Laziness. This post has been in my drafts for a long time now and I finally decided to complete it. 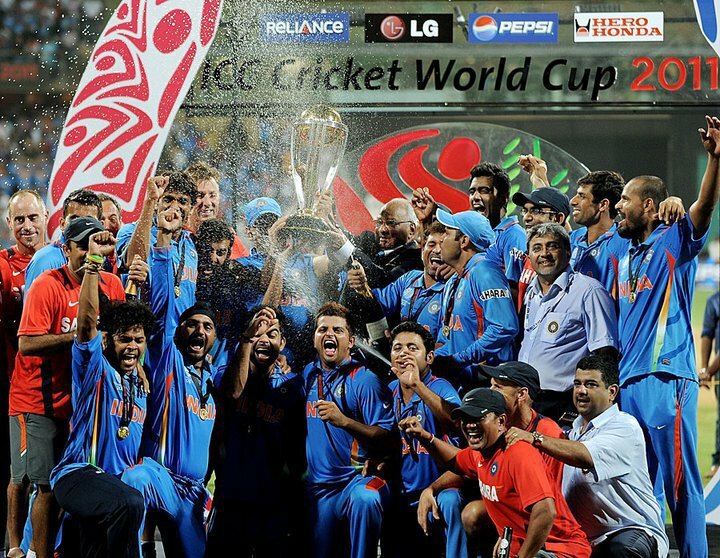 The final match of the World Cup 2011 will be something that will always be etched in my memory. From the moment India and Sri Lanka qualified for the final I started to detest the Sri Lankan team to the core. I was thinking, "How dare they come in the way of Sachin holding the cup" . I was being a complete douchebag addicted to prove that India can beat the Lankans. Normally my craziness would have been laughed off, but this time I was encouraged by my equally cricket-crazy friends. I cannot remember anything that happened in the last few minute before the match except for the collective sigh of "Teri maa ki " on everyone's lips when they saw Sreesanth's name on the playing eleven. The match then started and after a beautiful innings ( I did not admit that it was a great innings until after we won the match ) by Jayawardene. Zaheer & co. were pounded neatly and almost too sweetly by Mahela, the Lankans had made 275, it was a good score but I was confident that we could do it after all we had GOD in our ranks playing on his home turf. The script could not have been written more beautifully for him to finally achieve his Holy Grail. A Sachin century seemed to be awaiting us. But when the illegal slinger took Sehwag on the second bowl and then Sachin a few overs later my hands became a bit cold and for the first time a small feeling that maybe we couldnt win it crept into my mind, but still a not so small ray of hope was left in me and damn that hope was turned into a large pool of confidence by Gambhir and Kohli and I was back to my crazy joyous state and then Dhoni came along. I have always been a fan of this guy's cool rocking attitude. After a few tense moments he and Gambhir brought THE moment closer. And when we were a couple of runs away from winning the Cup. Here I was sitting thinking it was all due to the same boxers, shirt, shorts I was wearing and even the place where I sat since the time the World Cup started. When Dhoni finally hit that six,that moment, that shot and the collective release of a nation waiting for 28 years will always be etched in my mind. Everything from that moment is a bit of a blur. Now I have been living my entire life in Hyderabad and I have seen many a beautiful scenes in this wonderful city but what I saw that night surpassed all those. People were screaming, shouting, running around like crazy and hanging out of the windows of cars. In one of those rare moments everything in India came to a stand still and only one thing was on everyone's minds...... We are the World Champions !! What a glorious and eventful night ! !